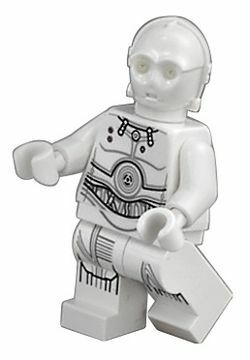 K-3PO is a Star Wars minifigure first released in 2007. A back view of K-3PO. K-3PO is made up of three pieces- the head, body and legs. The head piece mould is specially designed for protocol droids, and originally used for C-3PO. It features indentation for the circular eyes and the mouth, and a raised area going around the outside of the middle of the head, representing the join between the plating used for the front and the back of the head. The body piece is the only piece which is printed, and is printed on both the front and the back of the torso. This printing includes black outlining and grey shading on both the front and the back, depicting the various pieces of protocol droid plating including a chest area and circular stomach area on the front, and a rectangular plate on the upper back. On the right-hand side of K-3PO's chest are two red circles, which are used to represent the droid's Rebel Alliance rank insignia. K-3PO appears in the Gameboy Advance and Nintendo DS version of LEGO Star Wars II: The Original Trilogy. 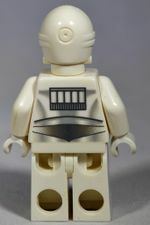 He is identical to TC-14, even though K-3PO is not silver. K-3PO was a white protocol droid who served the Rebel Alliance as a tactician. He also served as the coordinator of all droids in Alliance High Command at the Rebel headquarters of Yavin 4 and Hoth. However, K-3PO was destroyed during the Alliance's evacuation during the Battle of Hoth. This page was last edited on 9 June 2017, at 14:37.